Because 69% of today’s IT decision makers believe their environment is more complex than just 2 years ago, they often look to HCI as a potential stop-gap to streamline provisioning and app deployment. HCI is still just the first step in simplifying IT operations, though: you next have to consider if the secondary storage layer provides the needed availability. 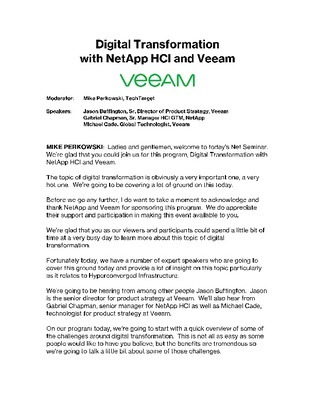 Read on here to see how a partnership between NetApp HCI and Veeam will address any availability gaps in your infrastructure with a combination of HCI, backup and DR orchestration, and non-disruptive data protection.